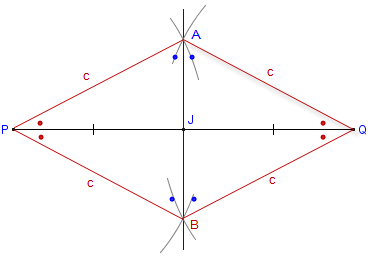 This construction shows how to draw the perpendicular bisector of a given line segment with compass and straightedge or ruler. This both bisects the segment (divides it into two equal parts, and is perpendicular to it. It finds the midpoint of the given line segment. This construction works by effectively building congruent triangles that result in right angles being formed at the midpoint of the line segment. The proof is surprisingly long for such a simple construction. The image below is the final drawing above with the red lines and dots added to some angles. 1 Line segments AP, AQ, PB, QB are all congruent The four distances were all drawn with the same compass width c.
4 Triangles ∆APQ and ∆BPQ are congruent Three sides congruent (sss). PQ is common to both. 8 Triangles ∆APB and ∆AQB are congruent Three sides congruent (sss). AB is common to both. Click here for a printable worksheet containing three bisection problems. When you get to the page, use the browser print command to print as many as you wish. The printed output is not copyright.